Disclaimer: While every effort has been made to ensure the accuracy of this publication, it is not intended to provide legal advice. Individual situations will differ and should be discussed with a licensed attorney. For specific legal advice on the information provided and related topics, please contact the author. Foreclosures provide an opportunity for homeowners and investors to get a great deal on properties they might not otherwise be able to afford. These properties can create instant cash flow and/or equity for those lucky enough to find them. But don’t be blinded by the dollar signs quite yet. Purchasing foreclosure properties involves unique risks that potential buyers need to understand and proactively address before closing the deal. Foreclosures are typically sold in “as-is” condition–that means you will not receive the typical seller disclosures or be able to request any repairs before closing. The risk involved in buying a foreclosure as-is is compounded by the fact that buyers often don’t have the right to perform an inspection prior to closing. Foreclosure properties often sit vacant for long periods of time, generally causing the properties to be in various levels of disrepair. The neglect of proper maintenance and repair may have even begun with the previous owner–if they weren’t able to keep up with their bills, they probably weren’t able to keep up with maintenance and repairs either. It’s also not uncommon for previous owners to be bitter and take out their frustrations by deliberately damaging the property. It is critical for buyers to reduce the risks of buying as-is by doing as much due diligence on the condition of the property as possible before buying. Walk around the property, look in the windows, talk to neighbors–get creative and find out as much as possible about the property. As with any investment, it would be wise to budget a set amount to help soften the blow of unanticipated expenses. Encumbrances are legal rights held by third-parties that affect the property. Encumbrances can include things such as mortgages other than the one being foreclosed on, tax liens, civil judgments against previous owners, or tenants residing in the property under a valid lease. Laws vary from state to state; however, these encumbrances are typically passed along with the purchase of the property and become the problem of the new owner. For example, it is common for previous owners to have unpaid property tax bills. Back taxes would have to be paid by the new owner or the tax department could foreclose against the property. Another common example is purchasing a property only to find that the current residents are tenants who still have 10 months left on their one-year lease. Luckily, most encumbrances are a matter of public record. 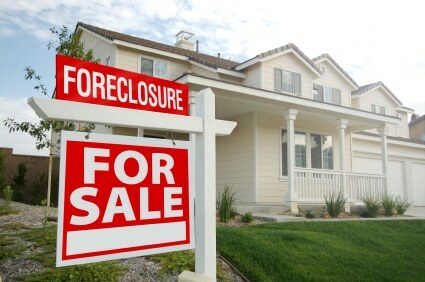 Buyers should always conduct a full title search before purchasing a foreclosure property. If you are not able to perform a title search on your own, professional title searches can be ordered for around $150. The time and money spent on a title search is absolutely worth it! Financing the purchase of a foreclosure can be tricky. Some lenders will not even finance the purchase of foreclosure properties, while those that do often use non-standard loan products to do so. Loan products where the amount of the loan is limited to the appraised value of the property can be problematic; as the disrepair of most foreclosure properties can lead to extremely low valuations. Delays in the purchase process can also impact financing since most lenders have time limits on rate approvals. Foreclosure purchase are notorious for involving extra paperwork and response delays that may result in less favorable mortgage terms if rate approvals expire and interest rates begin to rise. Before getting serious about purchase a specific foreclosure property, buyers should identify lenders that routinely finance foreclosures. It is a good idea to visit with a loan officer and talk through the process so that you understand the overall process, the requirements involved, and set appropriate time frames. Doing this beforehand will help set realistic expectations and avoid surprising setbacks once you are ready to move forward on a specific property. Find experienced professionals who can help you. These professionals will be able to help you anticipate, and avoid, many of the common pitfalls involved in purchasing a foreclosure. An experienced real estate agent will have connections in the foreclosure market to help you find potential properties and will be familiar with the unique closing process. An experienced general contractor may be able to help you anticipate, and complete, any necessary repairs. An experienced attorney will be familiar with your state’s foreclosure laws, can perform and review a title search on the property, and help review all legal documents involved before you sign anything. Although hiring professionals costs more money, it is almost always money well spent–your purchase is much more likely to go smoothly and successfully with the right help. Andrew Dickens is a North Carolina real estate attorney and the founder of Dickens Law Group. During his career, Andrew has worked side-by-side with some of the most experienced and well-respected real estate attorneys in North Carolina. He has represented a range of clients including publicly traded companies, multi-national corporations, financial institutions, REITs, local builders and developers, small family-owned businesses, and individuals. Andrew’s experience, innovation, and devotion to providing quality legal services are now benefiting the clients of Dickens Law Group throughout the state of North Carolina. Dickens Law Group provides real estate services to the entire state of North Carolina including Foreclosure Prevention, Landlord/Tenant Representation, and other Real Estate Matters. Additional helpful articles written by Andrew Dickens can be found on the Dickens Law Group Blog. You can connect with Dickens Law Group on Facebook, LinkedIn, and Google+.